Great moments in history captured in 100 photographs! From the opening of King Tut's tomb to the Wright Brothers' first flight, from the mushroom cloud made by the atomic bomb in Nagasaki to the first moon landing, these 100 pictures record some of history's most iconic moments. 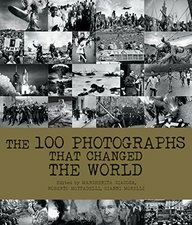 They remind us that photography not only chronicles major events around the world, but also serves as a means of raising awareness and changing public opinion. This expertly collated book, which includes detailed commentary on each image, is truly unmissable.